Solvero is a company specialized in data collection, panel management and reporting. We help our clients with expertise within market research concerning everything from questionnaires to advanced statistical analyses. We have the experience and the competence and our client’s need is our focus. By offering solutions through all types of methods we can help to collect data based on customer needs instead of offering a solution based on our product portfolio. Solvero is a proud member of ESOMAR and follows the ICC/ESOMAR international code on Market and Social Research. Solvero was founded in the beginning of 2013 by Anders Haraldsson, member of the Ethic council for market research and former Swedish representative of ESOMAR. Anders idea was, and still is a data collection company where focus is on quality and service from the first second. In a faster and a more digitized industry you need flexibility. Solvero is a personal and client oriented company that customize solutions according to your company’s needs. We have many years of experience helping our clients to find the right methods and in an effective way get reliable data for making the right decisions. Our business is imbued with quality, flexibility and innovation that we know are ingredients that are required to optimize solutions to suit each unique survey. We always try to be at the forefront of innovation and methodology. With our combined experience, Solvero’s focus is to be a knowledgeable, service- and quality oriented supplier. Our vision is to always be our client’s first choice, where a close and personal cooperation with a high customer understanding is in focus. As one of few actors in the market we’ve signed a union agreement with Almega and Unionen, which means that we guarantee our employees fair working conditions and a salary according to the union agreement. We also know that this gives us a possibility to attract the best interviewers in the business. 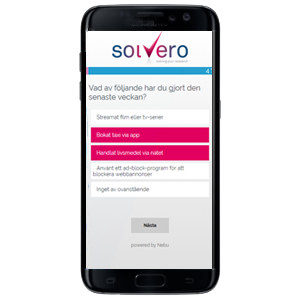 Solvero is providing data collection in Sweden, but also in the rest of Europe together with different partners. Most of our experience is within telephone interviewing, web panel surveys and mystery shopping – both by phone and by visits. To be able to offer our clients answers to a few questions of a national representative sample in a very cost efficient way we conduct 420 interviews each month in our telephone omnibus. That gives you the opportunity of adding one or several questions over a certain period of time to continuously be able to follow the development within specific areas or to screen the incidence of the wanted target group to be able to make correct budgets for any up-coming surveys. Except from the data collection we have great experience of making tables and charts and we may also help our clients with different statistical analyses. Our competence within these areas is the reason for many of our clients to choose Solvero instead of other suppliers. We deliver according to your specific need, whether it’s a raw data file of an online presentation. Telephone interviews of the general population, specific target groups or companies, conducted by our experienced market researchers. Available, modern surveys distributed by web panels, e-mail or sms. We have experience in both smaller and larger Mystery shopping surveys, as for example within the car industry. Personal interviews ”Face-2-face” in a central location, outside or inside different shops or at specific events. Measure the change of knowledge or preference over time in our telephone omnibus, based on a sample of the general population of Sweden. Standard or customized according to your specifications. We offer a wide range of deliveries and reports, anything from a raw data file to an online-presentation. We can help you in your statistical analyses, for example by ensuring significance in changes using correlation tests. Advanced app-like looking surveys, perhaps with mathematical calculations that will deliver a result through email within a few seconds? We can do it! A big part of our data collection is done through the internet, which is a popular alternative since it is a cost-efficient way of getting a quick result. We conduct surveys in our telephone recruited panel or together with our panel partner, which is one of the largest panel suppliers within the Nordic countries. Together we can reach more than 300 000 panelists in Sweden, Norway, Denmark and Finland. Our cooperation is unique which makes it possible for us to offer competitive prices for the Nordics. Above that we have a great experience of web surveys in countries as Estonia, Latvia and Lithuania. 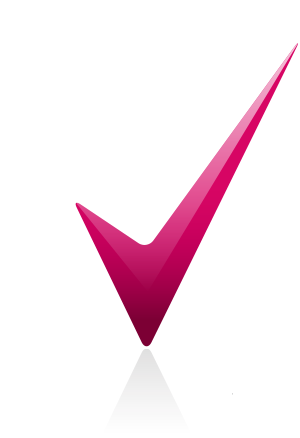 All web surveys are adapted for the high demand of user friendliness, design and for answering on smartphones and tablets. We use Nebu Dub InterViewer, which is a price winning survey software for modern and flexible surveys in the forefront of the market. Solvero’s panel is under construction and we are continuously recruiting members, for example through our telephone omnibus, where the sample is national representative including both fixed and mobile telephone numbers.